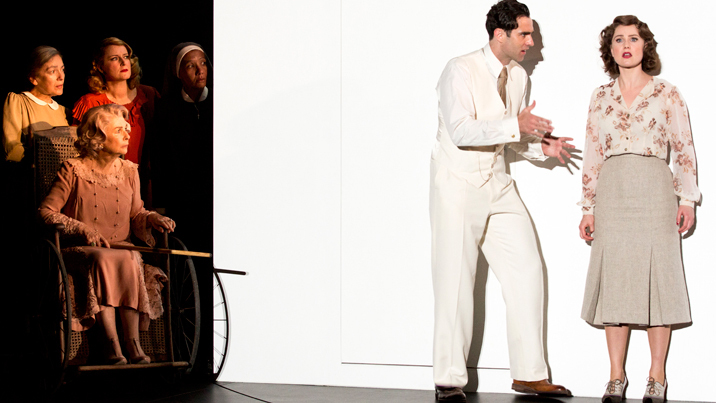 A Hymn to Her, this production re-calibrates the dynamic between Professor Henry Higgins and flower girl Eliza Doolittle by keeping the majority of Eliza’s transformative arc within her own power. Circumstances of society have placed, and seemingly trapped, Eliza in a different class, but her innate intelligence sees her grasp hold of the opportunity to better her station. Higgins has the knowledge that Eliza requires, but they are otherwise seen as equal. Sher’s foundation for this more equitable dynamic began with casting a pair of actors of roughly the same age. 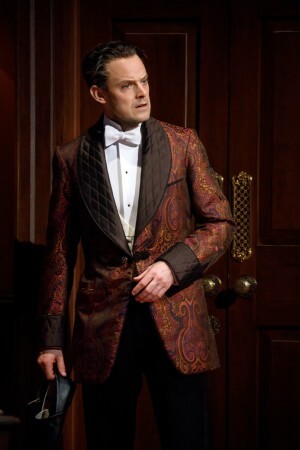 British import Harry Hadden-Paton has the handsome good looks of a romantic musical theatre leading man, yet successfully portrays Henry’s stilted, socially misanthropic countenance. Henry’s realisation of Eliza’s disturbance of the world he has created is all the more powerful for the fact that she ultimately retains the upper hand. 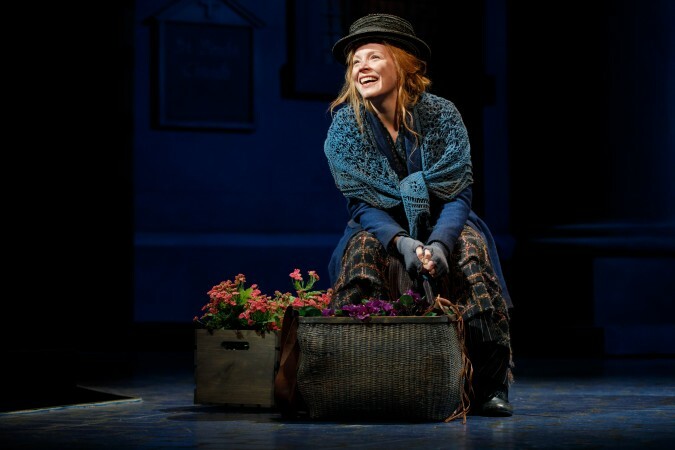 Lauren Ambrose is a revelation in her first Broadway musical role. Five seasons of Six Feet Under certainly never revealed that she possessed such a lovely soprano voice. Ambrose’s cockney Eliza is less shrill, and in the scenes where Eliza retrains her speech, Ambrose portrays the language work itself as the challenge, rather than focusing on the struggle against Higgins. 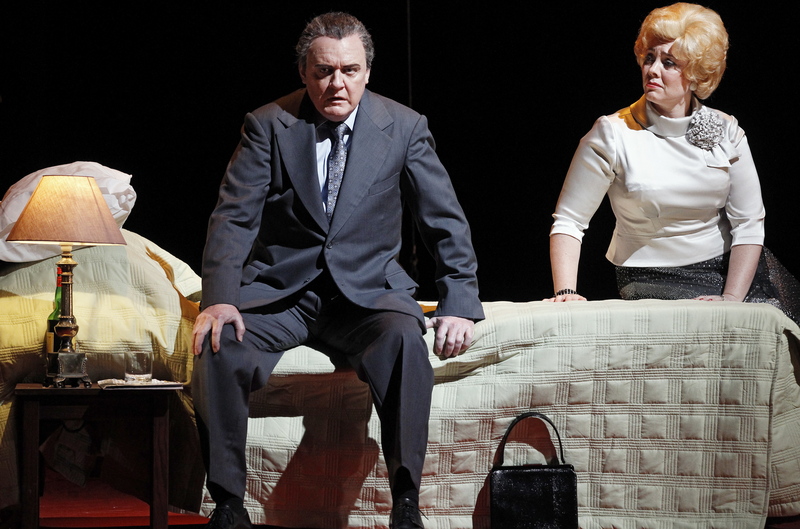 As Eliza finally masters the rounded vocal tones, Ambrose conveys a clear sense of chrysalis as Eliza rises from where she has been slumped on the floor, shedding her old skin as a new Lady emerges. Sher’s final nod to Eliza’s significance comes in breaking with tradition and giving Ambrose the final bow. 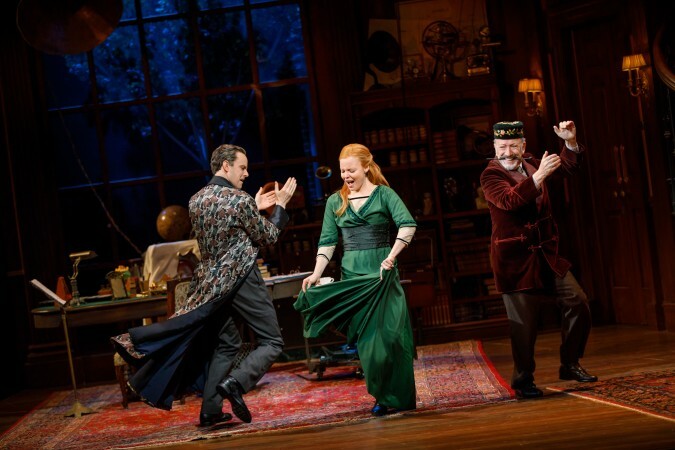 Sher has made tweaks to the musical, based mostly on the source material of Shaw’s original play Pygmalion but also with a bit of a nod to the classic 1964 movie musical. Michael Yeargen’s incredible design for Higgins’ home is the centrepiece for the production, and may very well be the most spectacular piece of stage scenery that I have ever witnessed. The two-story study is similar to many other productions, with a lovely high Victorian arched window looking out one of those celebrated lilac trees. The surprise comes when the set rotates, initially to show us Eliza about to be given her first shower. In Sher’s most successful original sequence, the set revolves during each verse of “The Servants’ Chorus,” allowing the passage of time to be conveyed by changes in costumes, positions and props between scenes. This is a stunning sequence, and builds up “The Rain in Spain” as even more thrilling showstopper. The focus on the Higgins home does, however, leave the remaining scenery somewhat lacking, especially in the massive performance space of the Vivian Beaumont. 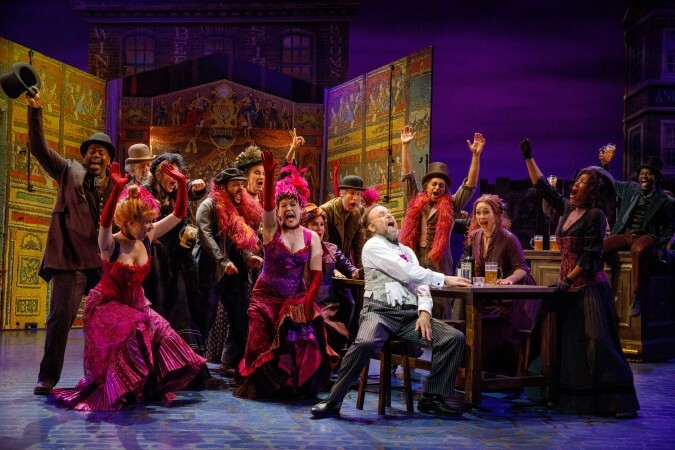 The flexible stage space is given a false proscenium arch (coloured with the marketing design for the show), yet the lack of wings robs the usual impact of moments such as Eliza’s entrance at Ascot. Mrs Higgins’ conservatory is a particularly two-dimensional set piece, and the Ascot club tent is a simple piece of awning hanging high overhead. The absence of scenery at Ascot is covered by having the ensemble enter in silhouette and stand with their backs to the audience for the scene between Pickering and Mrs Higgins (who is deprived the luxury of an actual car). A curious short scene is added in front of Higgins’ home after Ascot before Freddy appears to sing “On The Street Where You Live.” Mrs Higgins berates Higgins for the way that he and Pickering are playing with Eliza like she is a live doll. Sher has moved the position of interval, ending act one as Eliza leaves for the Embassy Ball. This facilitates an ingenious design idea, in that the orchestra is discovered on stage in a glamorous tiered bandstand for the Embassy Ball at the top of act two. Instead of serving as the act one cliffhanger, Zoltan Karpathy’s investigation of Eliza ends scene one of act two. In an odd move, this interaction occurs all the way downstage as the scene is changed back to Higgins’ study. Eliza then steps back onto the set from the front as “You Did It” proceeds. The aspect that will cause much discussion amongst theatregoers is the change of direction in the final scene. The original script is followed, with an additional piece of direction that will not be spoiled here. It will be noted, however, that the change is entirely in keeping with the overall tone of the revival. 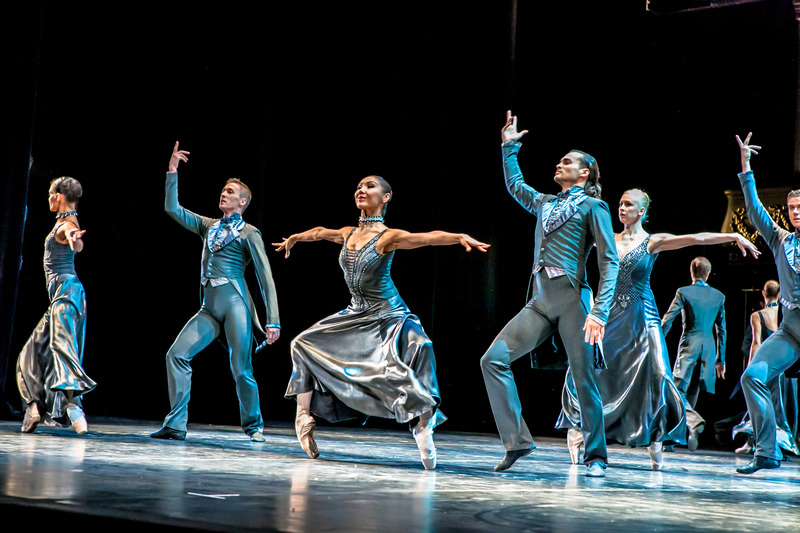 Catherine Zuber’s costumes are reliably dazzling. Mrs Higgins’ feathered creation for Ascot gives grande dame Diana Rigg an eye-catching first entrance. Always a design highlight, the sumptuous Ascot costumes are reimagined here in shades of pale grey and lilac. Eliza’s hat for Ascot is a gravity-defying wonder, and her elegant ballgown is gorgeously matched to her strawberry blonde hair. Jordan Donica sings foppish Freddy Eynsford-Hill with a luxurious vocal tone. 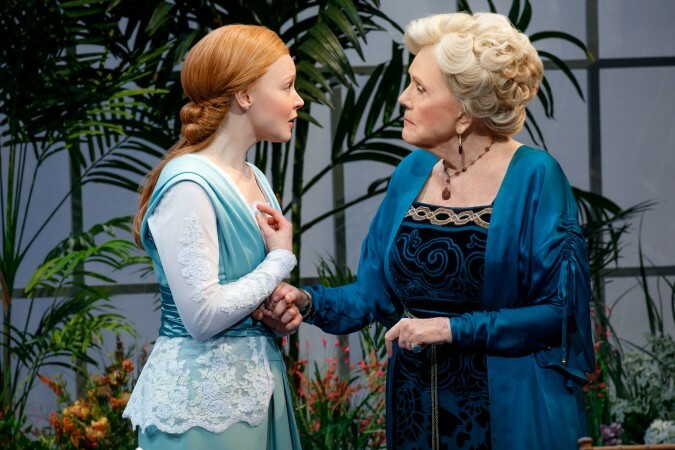 The audience is treated to an extended reprise of “On The Street Where You Live” while Ambrose changes from Eliza’s ball gown back to daywear. 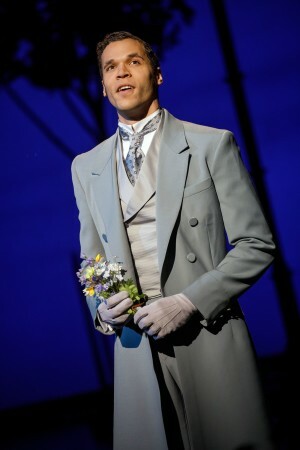 Have we lived long enough that an actor who portrayed heartthrob prince Fiyero in Wicked can now play Eliza’s father Alfred P. Doolittle? 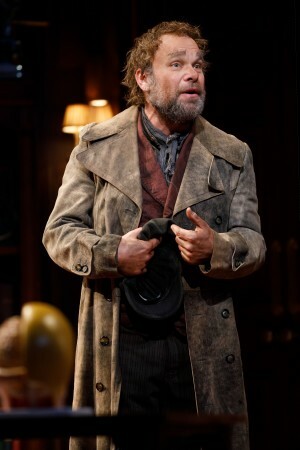 Apparently we have, and Norbert Leo Butz brings abundant energy and well honed comic chops. Allan Corduner is all class as Colonel Pickering. Linda Mugleston adopts a forbidding Scottish brogue as Mrs Pearce. 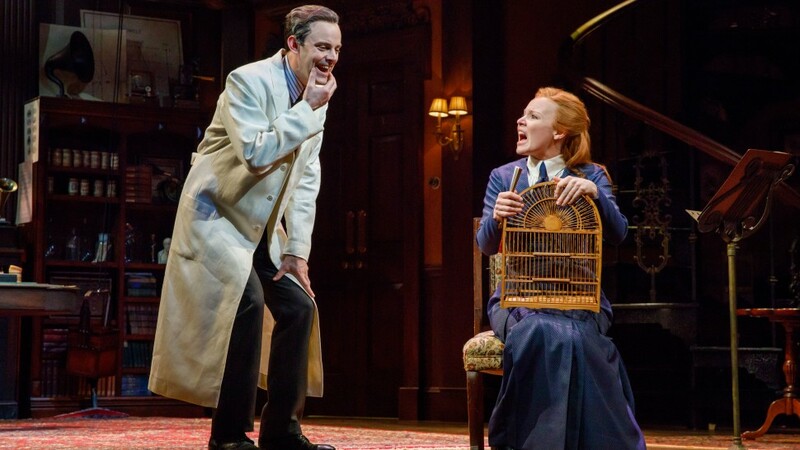 The revival of My Fair Lady is set to be an extremely hot ticket for lovers of classic musical theatre. The scope of the staging means that it will best be seen in this current venue. 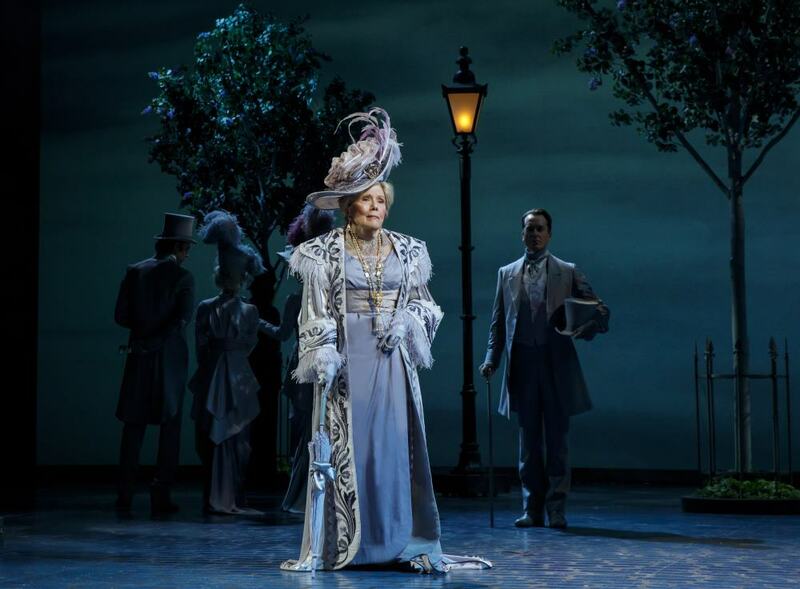 My Fair Lady was reviewed 8pm Saturday 31 Mac 2018 at Vivian Beaumont Theater, New York, where it officially opens on 19 April 2018.